Nominations are now open for the 2018 UBC iSchool Distinguished Alumni Award! 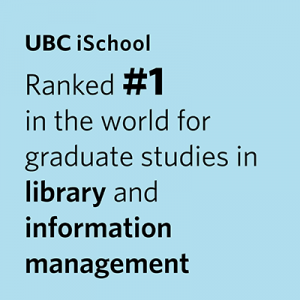 The iSchool Distinguished Alumni Awards celebrate the achievements of graduates from UBC iSchool (Library, Archival and Information Studies). The Awards recognize exceptional accomplishments by our alumni at the local, regional, national or global level. Nominate a colleague or fellow alum and help celebrate their achievements. Nomination forms are now available and nominations are being accepted until Saturday, September 15. The 2018 award recipient will be honoured at the UBC iSchool Awards Gala on Thursday, November 1 at 6:30pm on the Vancouver Point Grey Campus. More information on the Awards Gala will be distributed in the coming weeks.